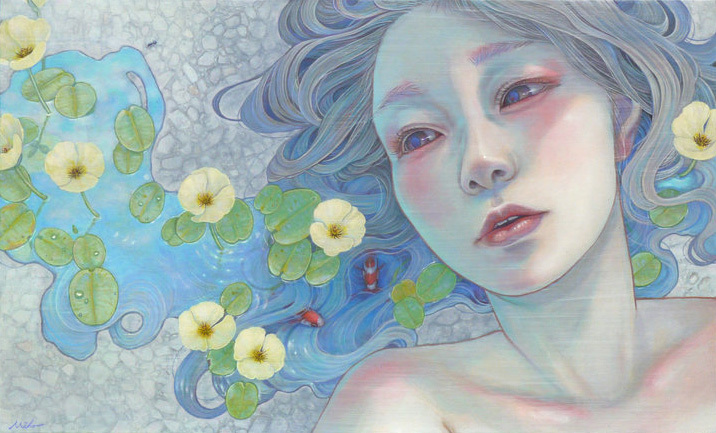 The exquisite subtleties of colour, line and tone found in Miho Hirano’s ethereal oil paintings infuse her dream women with a myriad of delicately emotive layers and create nuances of intrigue and intricate depth. 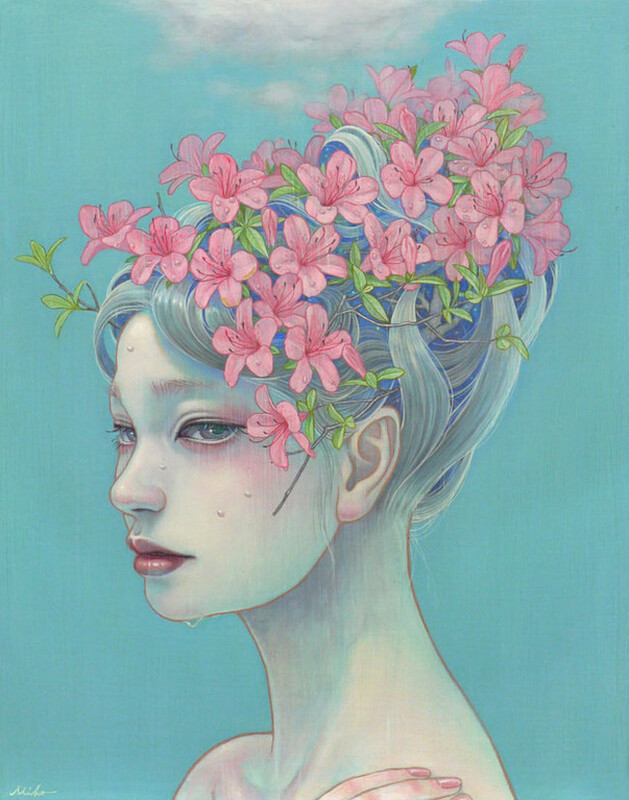 Through a sophisticated combining of facets of her Japanese heritage, including the traditional painting style known as bijin-ga and also the manga she grew up with, Hirano explores concepts of palpable emotional connections and elaborate inner realities. 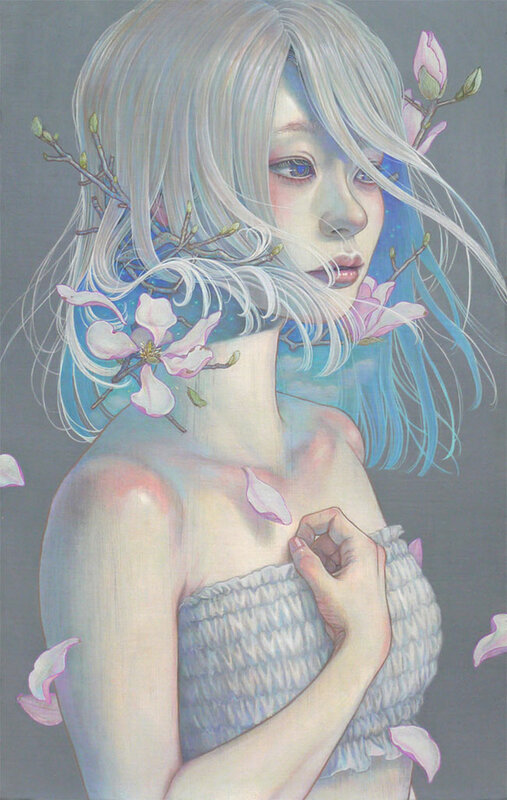 Utilising the hair of her female protagonists as a symbolic signifier of femininity, Hirano incorporates elements of the natural world, pushing the symbolism further and forming a synthesis which aids in the thematic exploration of such topics as identity, consciousness, strength and transience. 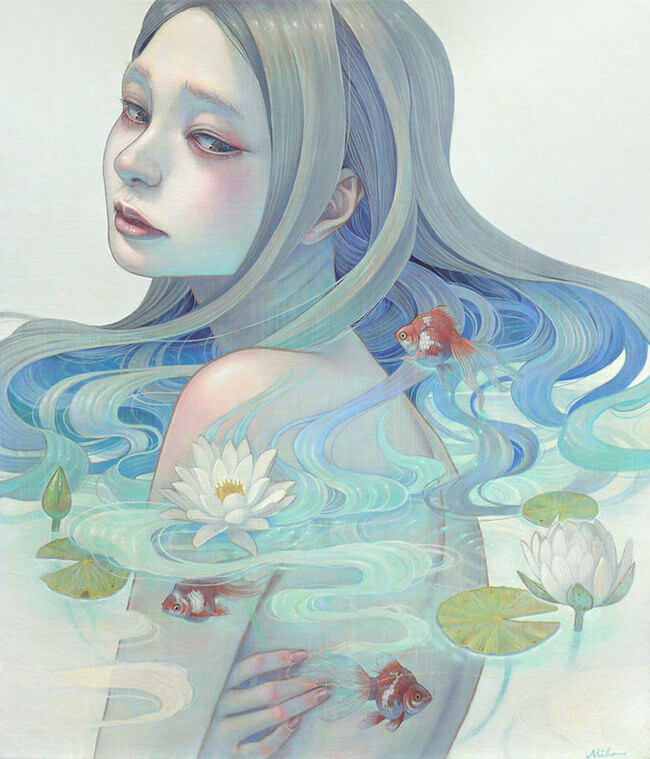 During her relatively short career as a professional artist, Hirano has established a uniquely stylised and ultimately beautiful visual aesthetic through which she opens up dialogues of fantastical origin, and which also have at their core, all the truths, complexities and frailties of the human condition. 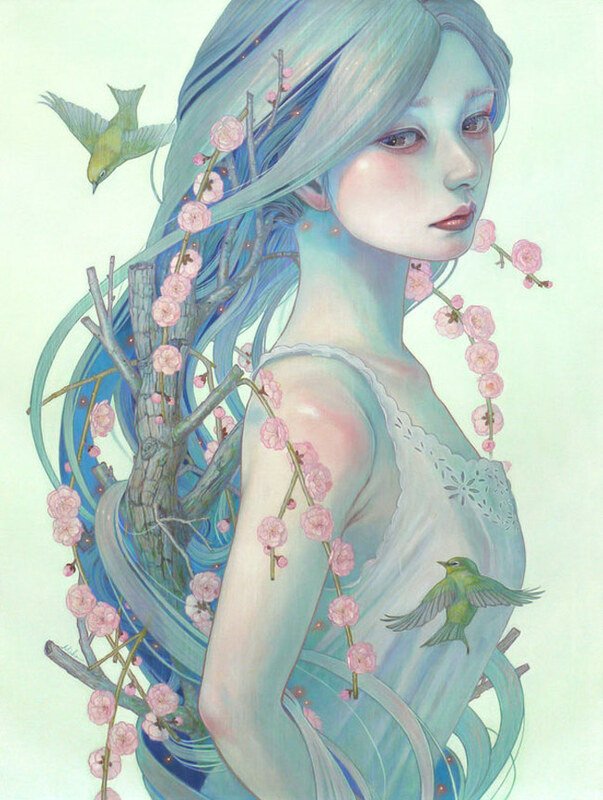 Miho Hirano is a Japanese artist who is currently living and working in Chiba, Japan. 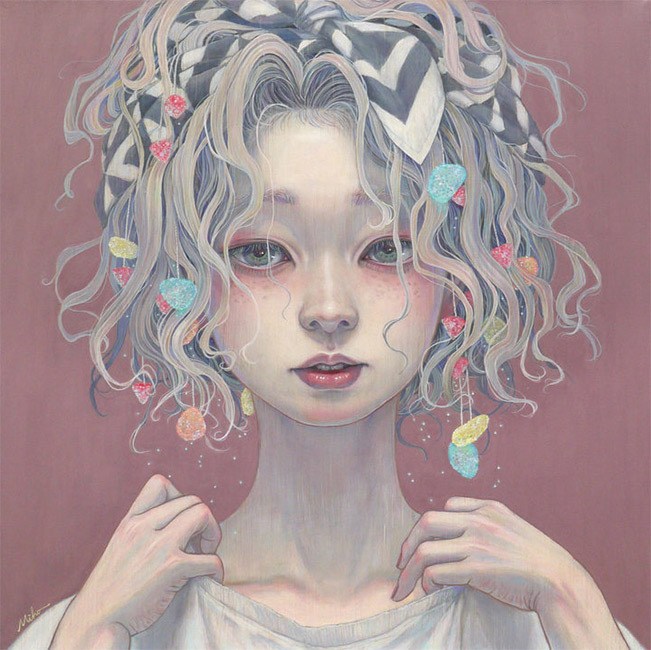 She graduated from Musashino Art University in 2008 and started began painting professionally soon after. 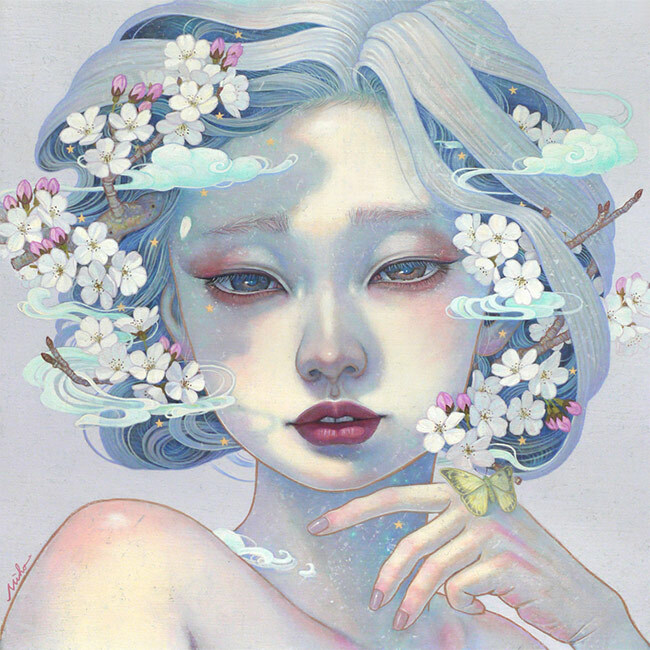 Miho has exhibited her work extensively throughout her native country and has more recently started showing in the US, in exhibition hosted by the ever wonderful Corey Helford Gallery. 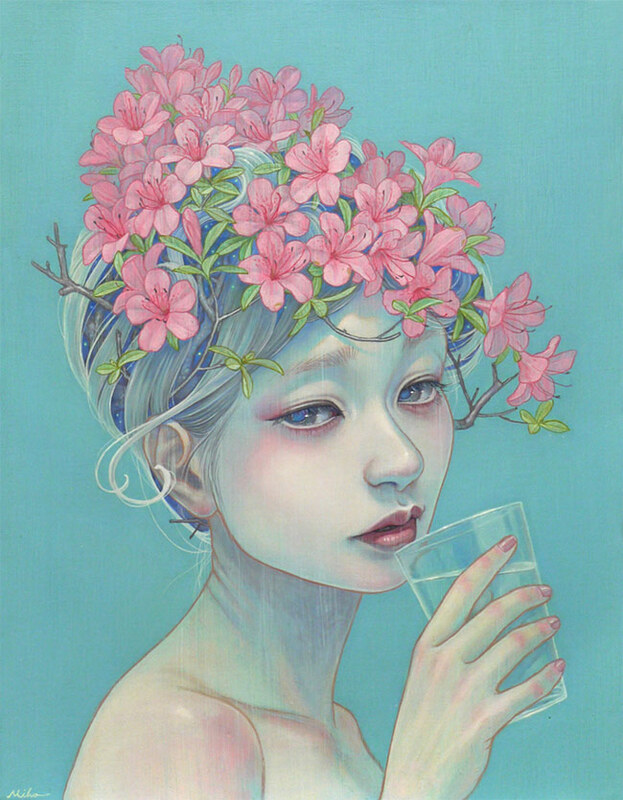 WOW x WOW recently seized the opportunity to speak to Miho about her latest body of work, entitled ‘Beauties of Nature’, which is currently on show at Corey Helford Gallery and will remain so until the 30th of December. 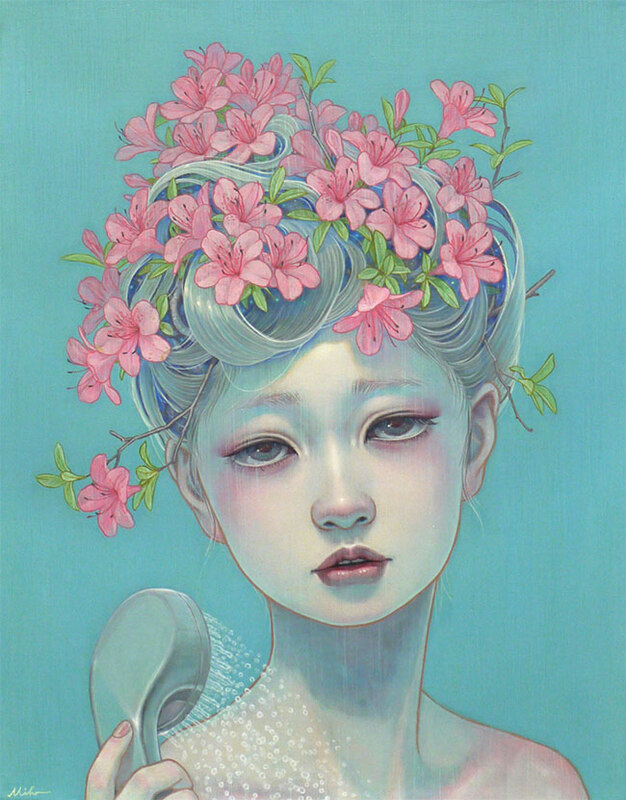 This fabulous new collection represents Miho’s first major solo exhibition in the US and is comprised of some truly stunning work. 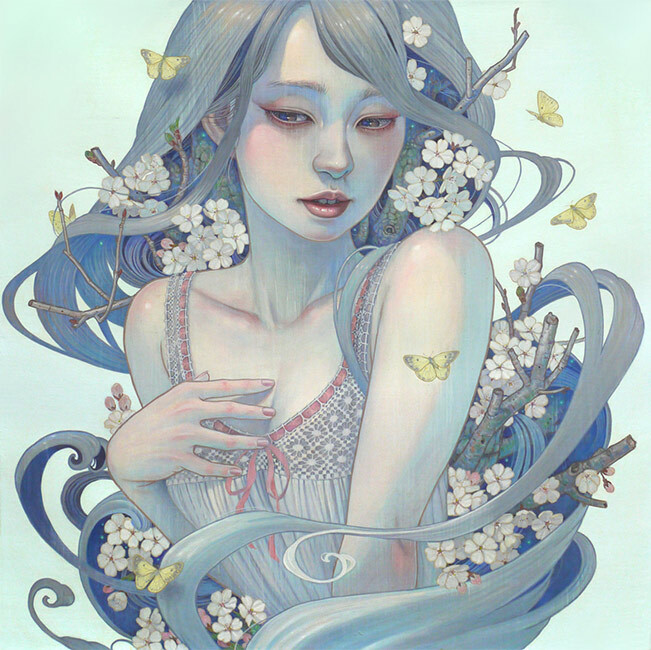 Read on, to find out more about Miho’s inspiration and ideas. Hi Miho, thanks very much for making the time to have a chat, we really appreciate it. 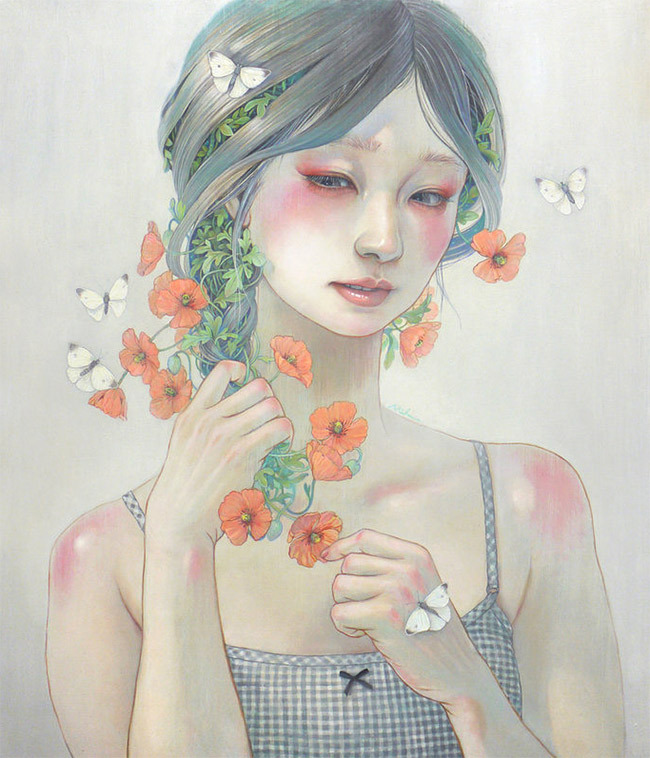 Let’s start off by talking about ‘Beauties of Nature’, your current solo show at Corey Helford Gallery. One of the paintings on exhbit is entitled ‘Mental Conflict’ and shows a young female with bolts of lightning cracking around her head. This is a noticeably more violent natural element to encounter in your work and we’d love to hear you discuss the piece. Although this body of work might give a more violent impression than my past work, in this case, thunder is a natural phenomenon that I am used to seeing in my life. So, I incorporated it into my work without any real concern as to whether or not my work was becoming more aggressive. 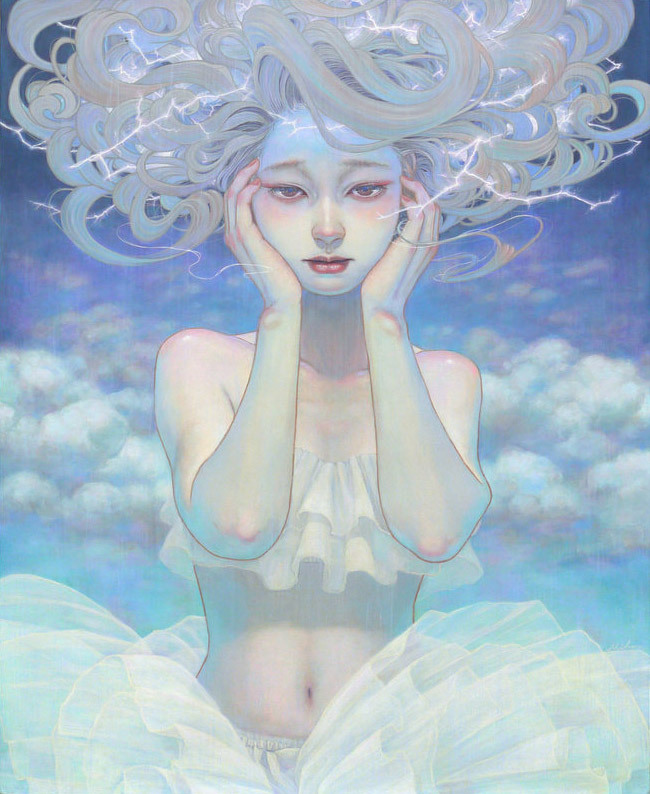 For me, a natural element like thunder is just as meaningful as using other motifs like flowers or plant life. 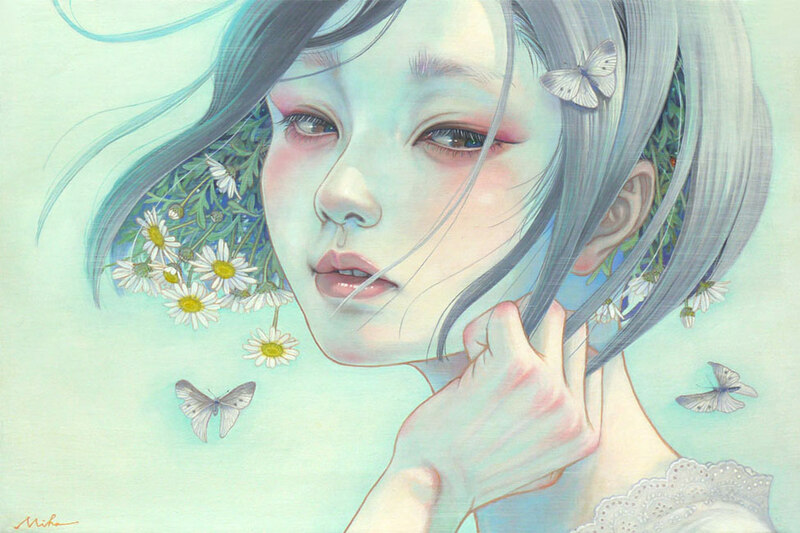 The visual aesthetic you have developed has its roots in both the traditional Japanese painting style of ‘bijin-ga’ and the fantastical quality of the manga you grew up appreciating. Can you tell us what it was about these two artforms that captured your imagination so powerfully? What continues to excite you about them the most and which of inherent qualities do you feel can be seen within your own artwork? 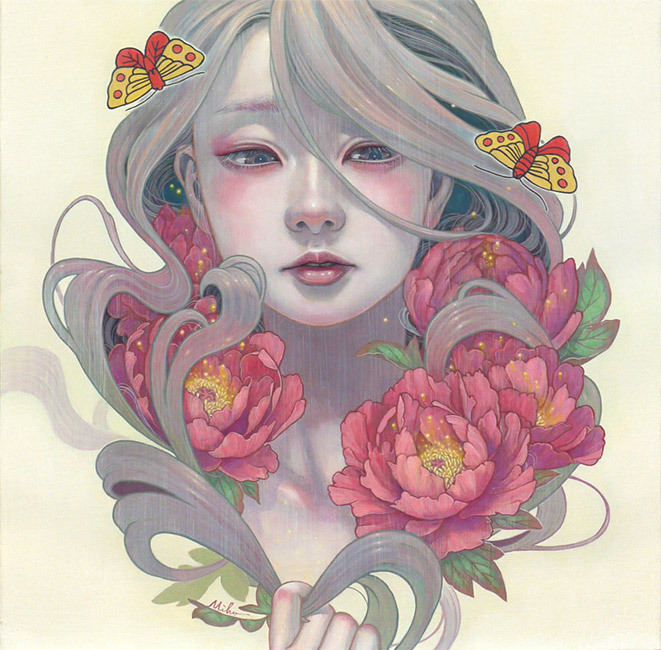 Japanese manga and animation encompasses a lot of styles – I am especially influenced by my favorite comics, mostly Clamp works, Sailor Moon, and so on. 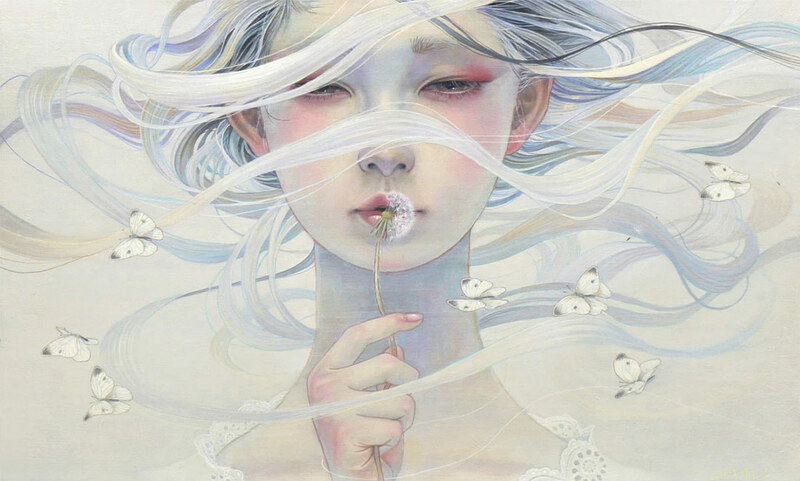 I am a manga reader, but I also like fantasy stories. 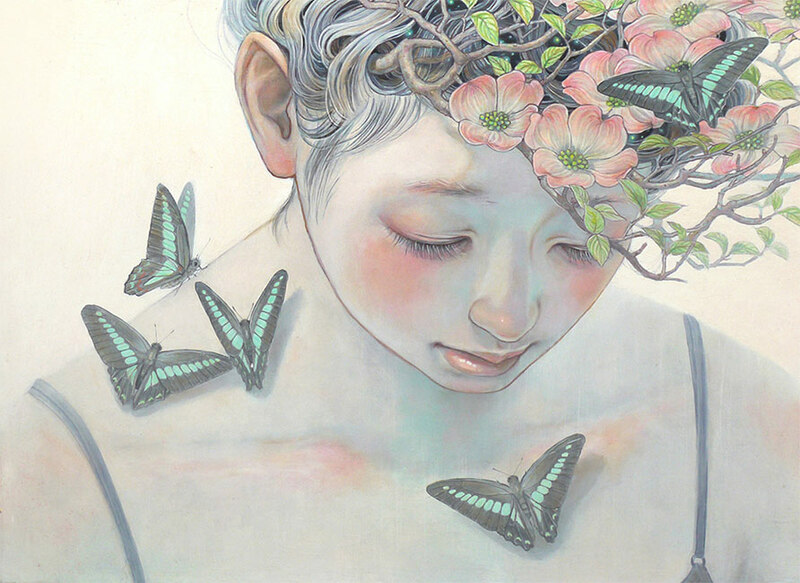 I’m not reading any manga comics right now, but I do cherish the sense of childhood innocence and stories about that. Even though I don’t draw ‘cartoons’, I try to breathe a sense of fantasy into my figures. 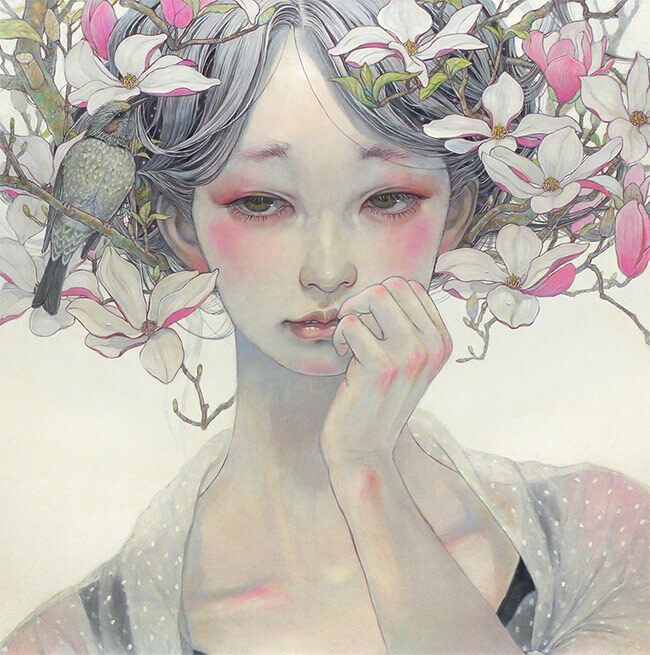 Your works are very carefully composed, incorporating a tremendous elegance and ethereal grace. What are your thoughts about beauty in reference to man-made artefacts and what aspects of beauty do you like to consider producing when your own work? 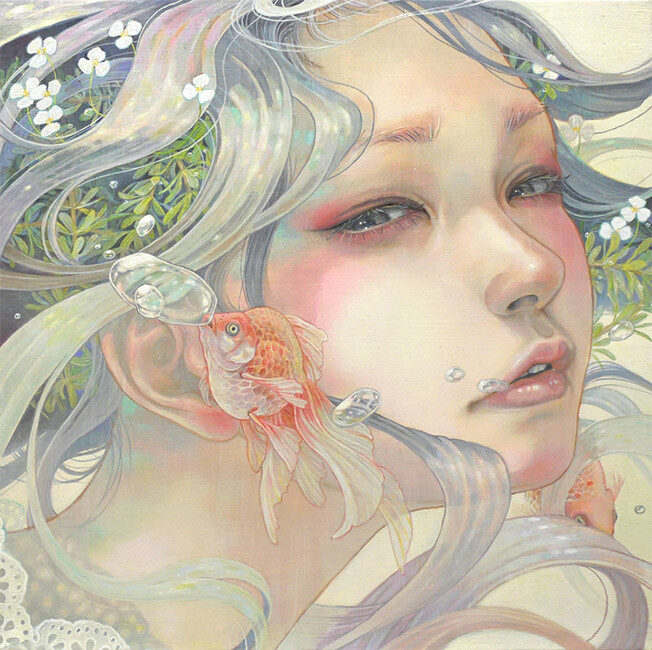 My work doesn’t employ traditional techniques, but I do try to achieve a feeling of ‘charm’ that comes with traditional works. I don’t necessarily set out to paint something beautiful, but I am aware of the harmony that occurs between the figures and motifs, and that for me creates a sense of beauty. The natural world that surrounds you clearly has important part to play narratives, which commonly sees themes merging with flora and fauna in some way. We are interested to hear about where you’ve lived throughout your life and your thoughts about how these locations have influenced your art. The environment where I have been living is neither rural nor urban. My mother liked caring for plants and living things, so I think that my awareness of animals and plants is strong because of this. I think that the influence of my home environment while growing up, has had a great impact on me. 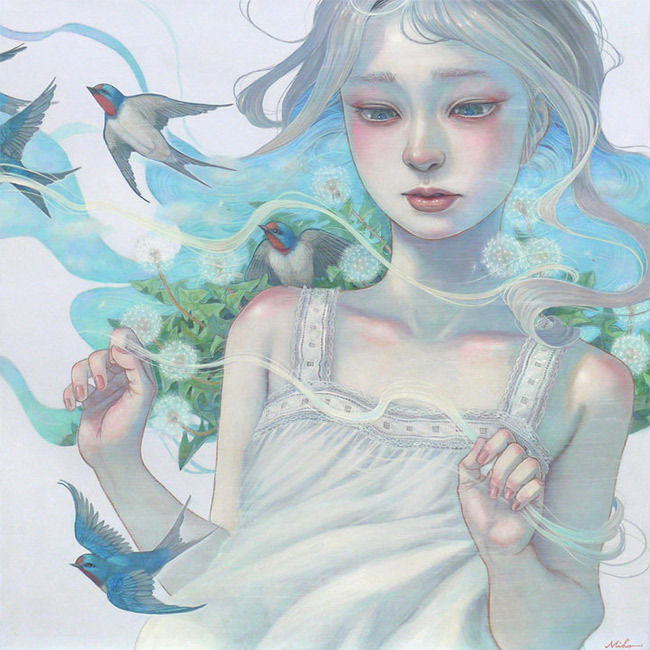 How personal or autobiographical do you allow your art to get? When you look back at certain pieces or larger collections of your own works, do they remind you of certain events or eras in your life? 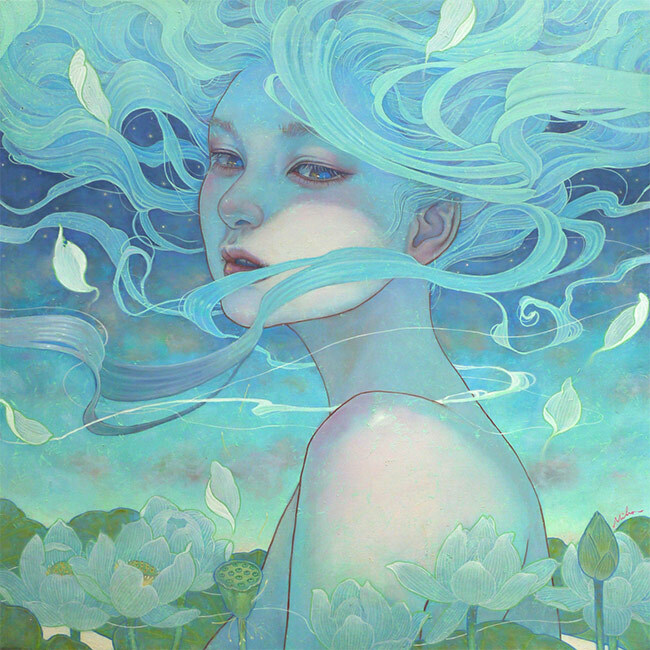 Each piece is personal in a way, because when I paint, it is for myself. My work doesn’t depict specific scenes or events in my life, so it’s not really inspired by my personal history. In 2014, I felt motivated to become a full-time professional artist, and even if I weren’t a professional artist, I would never give up and still paint. I think that was an important decision in my life and it keeps me going. My work changes little-by-little, but I always try to draw what I think while I’m painting. I think to myself, ‘I want to see a picture and begin imagining it.’ Every painting is a way for me to emphasize my visions. So, it’s difficult for me to say that my work is ‘evolving’, even though it is certainly changing. In order to get a better understanding of the personality of an artist, it can help you get a peek behind the curtain, or maybe just a tale about a hardship you’ve overcome which has helped define the person and therefore artist that you are now? 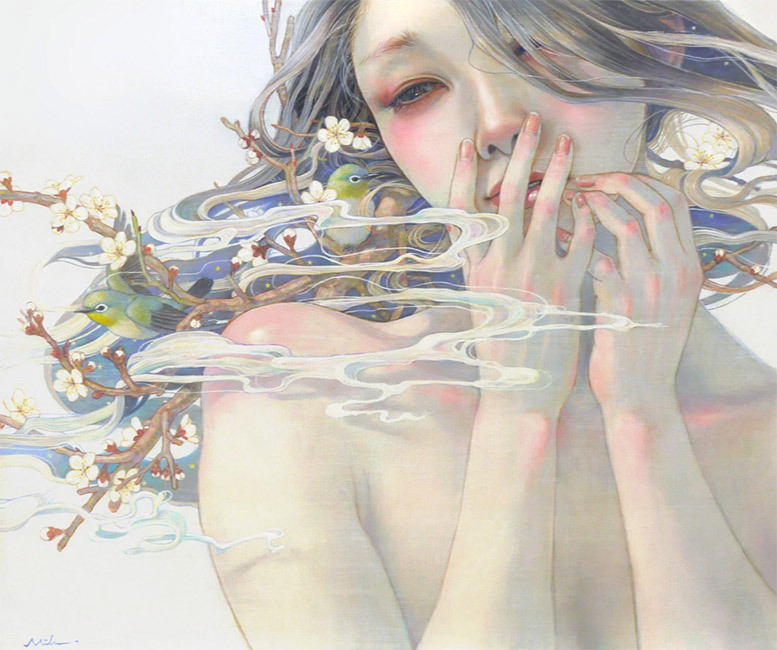 Ever since I was a little girl, I felt that I was not good at expressing myself with words. Any hardships I experienced came from feeling stressed at school or in my early life, so painting became my way to escape reality. 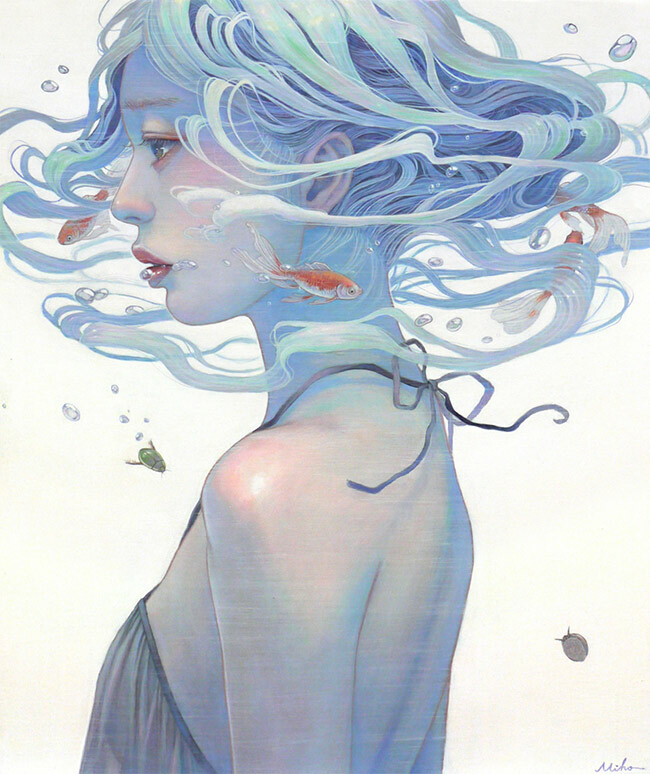 I found meaning in my drawing, and drawing is still an essential part of my ability to find confidence and strength. Klimt’s ‘Die Freundinnen’, even though it was destroyed by a fire set by retreating German forces in 1945 at Schloss Immendorf, Austria. I like the face of each of the subjects in this piece. The atmosphere between them feels warm, transmitted from their expressions and the hues. 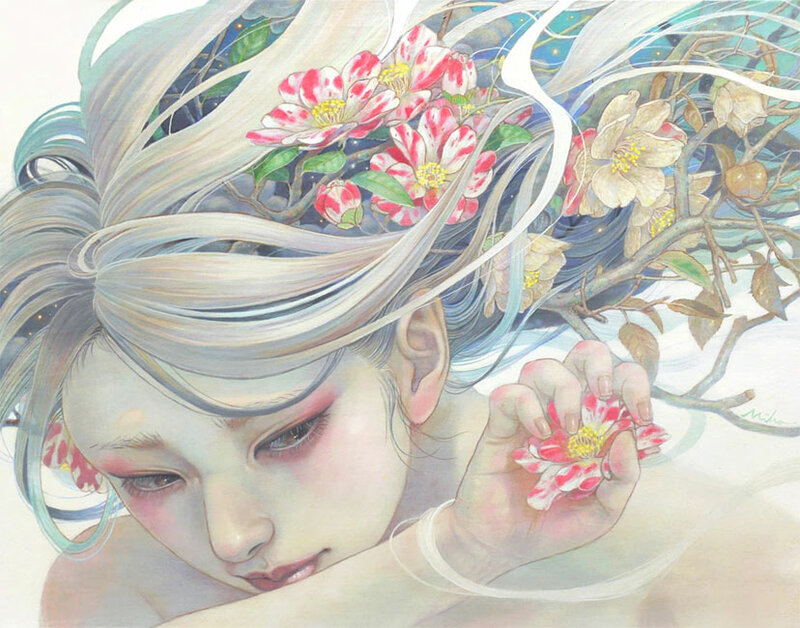 What’s next for Miho Hirano? I currently have several group shows in the works. 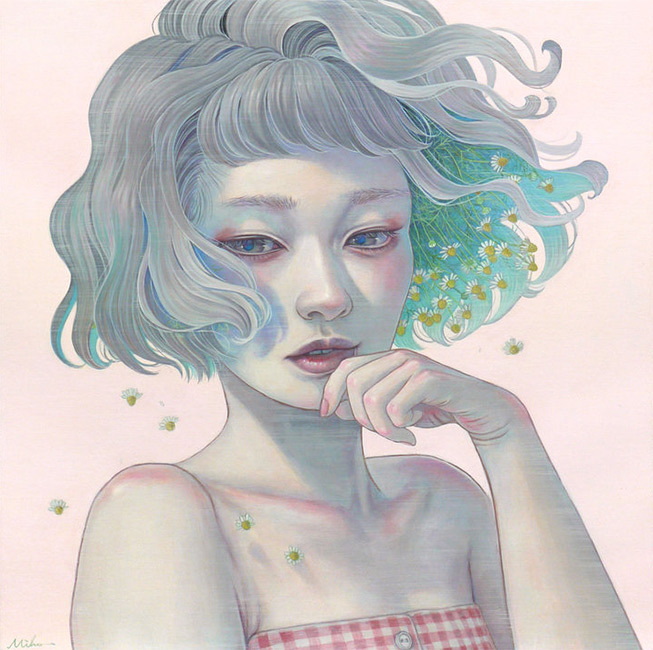 Touching and memorable, full of purity and genuine artistic vision of gentle femalehood.